ZA181LP - Runway Centerline Light - ATG Airports - Description - A low profile version of the existing ZA181 fitting, designed to reduce damage to aircraft, snowploughs or the fitting itself. 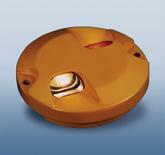 Suitable as a runway centreline or touchdown zone fitting, the ZA181LP is designed for use up to CAT III conditions. Lightweight aluminium design reduces weight and eases handling in the field. Long life halogen lamps provide 1500 hours at full intensity or in excess of 4000 hours in practical use.